Deputy Foreign Minister, Radek Sikorski, forced him to apologise. caricature of Poland, no less offensive, and much more dangerous. the subtext that this would always be the wrong thing to do. important business of getting lots of cheap oil and gas from that nice Mr Putin. certainly has every opportunity to do so now. plus the 1968 invasion of Czechoslovakia will probably be the most interesting. their bits of the files. and the USSR were as bad as each other". much rather forget, if they ever knew it in the first place. 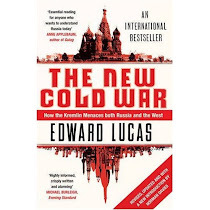 # Edward Lucas is Central and Eastern Europe correspondent for The Economist. Tallinn, know some very brave Czechs and highly efficient Russians). political maturity, German flexibility and Swiss cultural openness. financial bubble that cost millions of Russians their savings in 1998.
while Russia at least tried to privatise and liberalise. quaint as the ability to hunt a woolly mammoth or sharpen a flint axe. the late 1980s to take Yugoslavia seriously. too complicated and faraway for Western public attention to focus on. neighbours, Germany and [sic] Russia." most revealing question is still: "What were you doing before 1989? And what did your parents do?". perhaps less principled) than the naive outsider might expect. almost everywhere: kow-towing to higher authority is deeply ingrained. grovel: humiliation is cheap if it gets you what you want. worst. They just happen to be where I find my flint axe quite useful too. pro-independence movement, Sajudis, in early 1990.
nervous, blurry world of collapsing Communism. Soviet-occupied Afghanistan with the resistance. order was never completely clear). travel to faraway places were all rare skills. journalist, Radek Sikorski, has just been sworn in as defence minister. Communist version of the past, present and future was an evil fiction. In politics, it's the homeland that's humming. interlocutors look increasingly puzzled and start edging away. expecting a cover-story, have never allowed me near him since. much of the Belarussian opposition in the past. Al-Qaida target (no it isn't logical, but that's never bothered them). Plus he supposedly wants to sell the country to foreign speculators. saying it loudly won't help the good guys win.